Black Fruit of the Loom Valueweight t-shirt with large gold prints + digital download code. 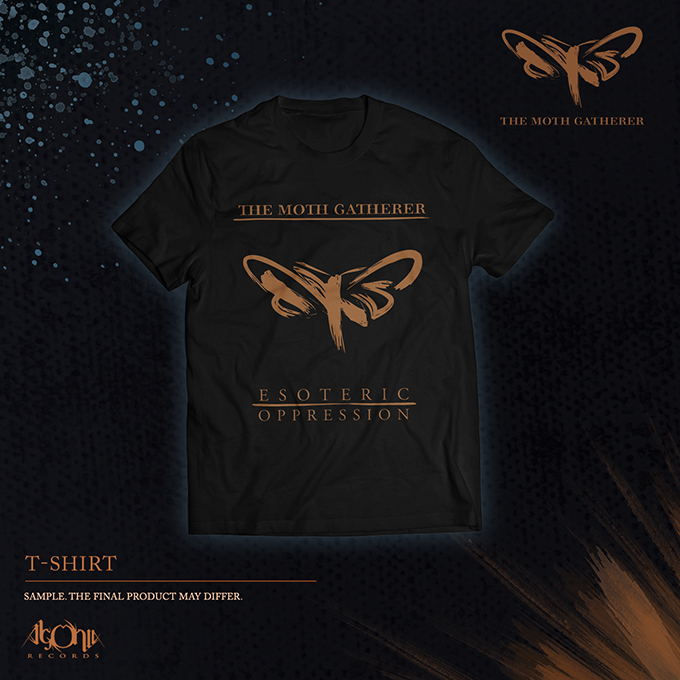 THE MOTH GATHERER emerged in 2008 on the initiative of Victor Wegeborn and Alex Stjernfeldt, as a form of therapy to help them deal with loss. 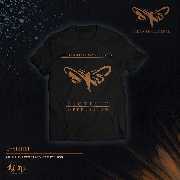 The name of the band is an allegory for finding hope; similarly to moths who are always searching for the light. A band of varying genres, centered around atmospheric doom, sludge and post metal. Their prolific approach includes electric musical stylings, along with traces of melodic post-rock. They've evolved and matured their sound over the course of three releases; each of which improved the formula and added a new layer of atmosphere and depth. "A Bright Celestial Light", the 2010 debut, showcased the band's unchanged attraction towards long and complex compositions, and exposed the inner urge to channel emotions and difficult experiences. "The Earth Is The Sky", the sophomore album from 2015, took the songwriting to a whole new level, and have deepened the subtle, yet significant electronic aesthetic. Along with the 2016 EP, "The Comfortable Low", the band has been consistent in their growth. "Esoteric Oppression" is the next step in THE MOTH GATHERER's journey; one paved with distress and frustration, yet worth the turmoil. Guest appearance from Messy Mathi (Barst) on the opening track "The Drone Kingdom". Recorded in several recording studios. Guitars, bass and drums tracked at Studio Underjord with Joona Hassinen (Vanhelgd, Saturnalia Temple, Year Of The Goat). Mixed by said Joona Hassinen. Electronics and vocals recorded at The Lifestream Studio. Magnus Lindberg (Cult Of Luna) mastered the album at Redmount Studios.